I went to the south-eastern section of the Pilliga, about 35 kilometers along the Newell Highway from Coonabarabran going towards Narrabri. There is a walk there at the end of Yamingah Trail that goes for about one and a half kilometers in a loop. 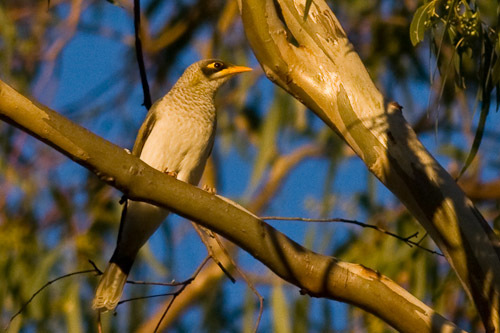 When I first got there, I saw a White-eared Honeyeater calling out on a tree right above me. He was making a big ruckus. As I went along the track I spotted a Noisy Friarbird and a few Rufous Whistlers. The ubiquitous Eastern Yellow Robin made an appearance, of course. 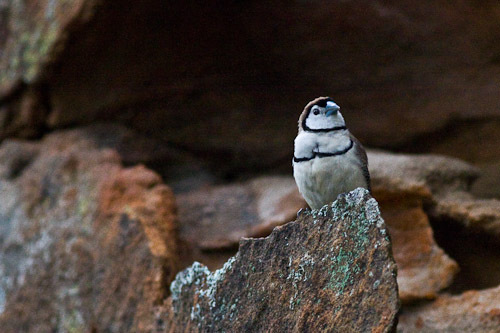 Along the cliffs I spotted a few Double-barred Finch who were coming out of a hole in the sandstone cliffs. It looked like they may have been nesting there, although it is very late. There were also a few Welcome Swallow who were darting in and out of a cave and then flying high up into the air for a fly around. I spotted a White-throated Treecreeper later on as well. There were a few small birds twittering amongst the pine trees. They were moving very fast and the light was very bad. 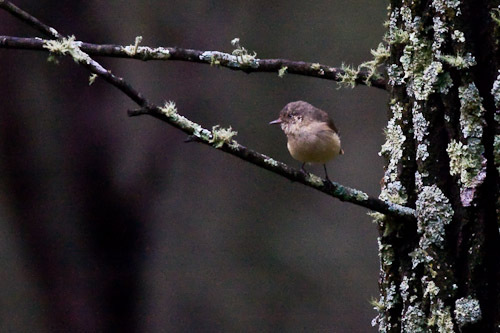 But I did manage to get this shot of a Buff-rumped Thornbill that I like quite a lot. After I got some petrol at Coonabarabran I headed off towards Gunnedah. A few kilometers along the road I stopped at the Oxley’s Crossing Rest Area where I had spotted quite a few Musk Lorikeet. The stringybark-type trees were pretty much in flower so they were having a good feast. The rain has managed to stop now and I even had lunch in the sun at 150 degrees East of Greenwich. But there are still some heavy clouds on the horizon so we have not seen the last of the rain. The Warrumbungles are near Coonabaraban, but I came in from the south via Gilgandra. Coming in on the road I saw the usual Magpie-larks, Black-faced Cuckoo-shrike and a bunch of Rufous Whistlers. I had not seen any for a while so it was good to see my favourite singing birds again. At the camp-ground there were a couple of Grey Butcherbirds foraging around in the grass. Split rock walk is the first stop that you come to so I went for a walk along the track. It is a 4.6 kilometer return walk. I saw more Rufous Whistlers as well as both White-plumed Honeyeaters and Yellow-faced Honeyeaters. This must really be where East meets West. 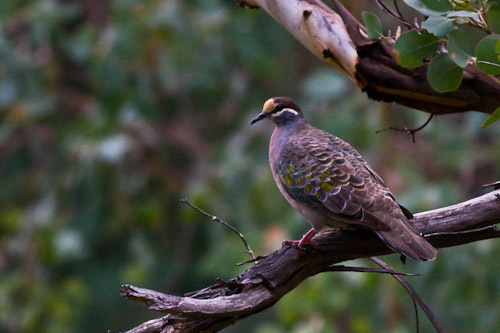 A Common Bronzewing fluttered up from the track as I went past and a few White-naped Honeyeaters were flittering around the trees with the other honeyeaters. Further up the track the Yellow-tufted Honeyeaters were making a racket as well as some Noisy Friarbirds. The last bird I saw as I came back the track was a Yellow Thornbill. 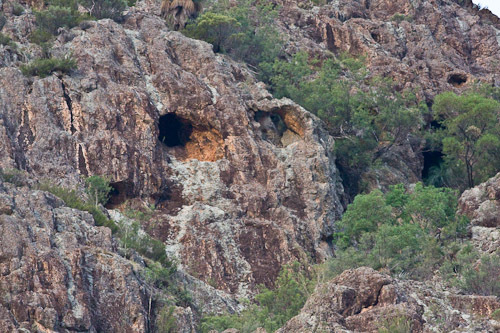 I did however manage to find The Phantom’s famous Skull Cave. This is where the Ghost Who Walks resides when he is at home. During the night it started to rain and by morning it was pouring. I laid in and read a book. There was no point getting up. Eventually I got up and headed off to Coonabaraban, where internet access seems to be a difficult concept to understand. Willie Retreat is one hundred kilometers from Warren in the Central West of New South Wales along the Carinda Road. Turn right at the Gibson Way and its about a couple of kilometers up that road. I was there last year at Easter but this year it was heaps hotter. I ended up getting dehydration which curtailed a lot of my activity. I ended up having to leave early to get some electrolytes. Dehydration is not something that you mess with. There were millions of grasshoppers around and the birds were feasting on them. The Apostlebirds were funny jumping around trying to catch them in the air when they jumped. 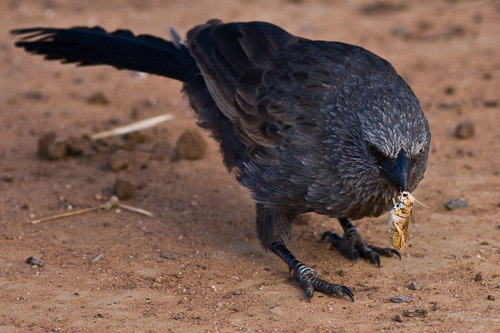 I could not decide on just one photo of the Apostlebirds so I posted two. I love these birds. I could watch them for days. They are like a constant comedy the way they grizzle and fight and jump around all over the place. A pair of Sacred Kingfisher were flying around all over the place, mainly darting into the mini-wetland to see if they could catch something. 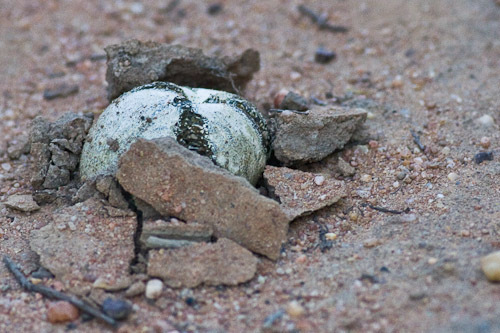 A mob of Grey-crowned Babblers were constantly coming in and around my camp and at one stage I put some water into some bowls and they were washing and drinking about three meters from me. I was really disappointed that I got sick and could not spend more time here. The place is thick with birds and it is very green after all the recent rains. I took the back road from Dubbo to Warren and stopped off along the banks of the Macquarie River for a snooze. After waking up rather befuddled, I had dinner and kept going towards Warren in the night. During the day there had been thousands of grasshoppers, dragonflys hitting the car, and every couple of minutes you would hear a whack whack as something hit the car. When I stopped the grill of the van was covered in dead bugs and body parts. It was quite gruesome. During the night, there were thousands of little frogs hopping across the road, and every now and again I would hear a plop as I drove over one. I felt like a mass murderer. In the morning there were millions of Galahs. They were everywhere. 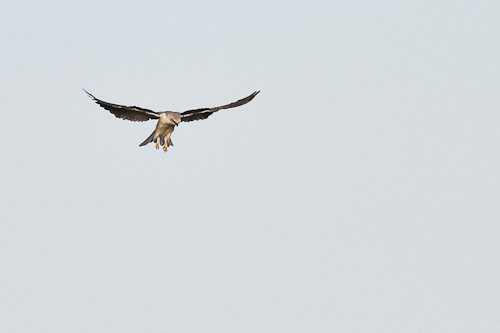 Then I spotted this Black-shouldered Kite hovering over the next paddock. He hovered for a while, then dropped and I could not see him after that. This next photo is really weird. 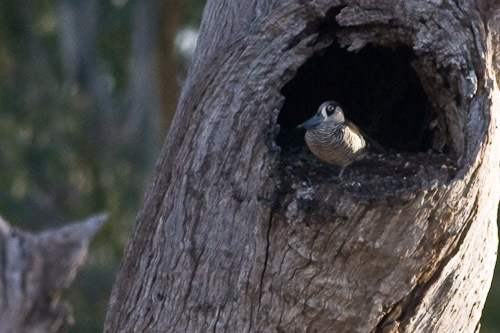 Its a Pink-eared Duck in the hollow of a dead tree. I could not believe it when I saw it but the evidence is there before your eyes. The camera does not lie. I took a walk around the ponds opposite the Treatment Works. Last year the ponds had bare dirt surrounding them and now it is very green with lots of grass and bushes growing. They really have done a fantastic job. I stirred up quite a few Red-rumped Parrots as I walked around. At the end of the pond, I saw a few White-necked Herons, and it looked like they might have been nesting there. This one is a juvenile. You can tell because of the stripes down his neck. 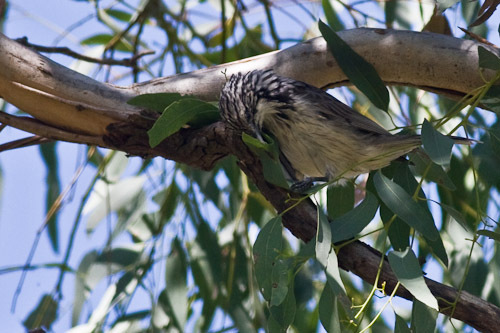 This Grey-crowned Babbler was sitting up in a small gum tree with his posse preening and poking at his feathers. It must have been time for the communal cleaning time. I did not see many raptors this time around. Probably because I had been expecting to. I did see a couple of ones I could not identify way in the distance, but nothing much close except for the Black-shouldered Kite. Hopefully I will get to see more on the way to Macquarie Marshes. I will keep my eyes peeled. Some people call it Devil’s Bend and some call it Devil’s Hole. Anyway, it is at the end of Brisbane Street in Dubbo, just about where it meets the Newell Highway heading to Gilgandra. I parked the van up the top near the picnic area and walked down the track. There were cars flying in and out kicking up heaps of dust. I was not impressed to say the least. When I got down to the river bank there were some 4WD’s pulling out some hoons car that had gone over the edge. It was quite a ridiculous scene. There were heaps of Sulphur-crested Cockatoos flying around screeching their heads off as well, and hoons in utes roaring around chucking wheelies. It was like a scene from Dante’s “Inferno” – extremely bizarre. 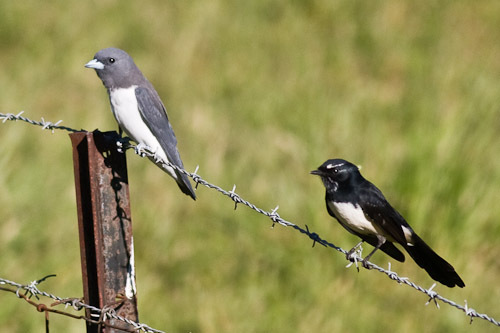 Luckily I managed to keep a cool head and take some photos of a White-breasted Woodswallow and a Willy Wagtail sharing a barbed wire fence. Later on they had an altercation and I think the Willy Wagtail chased the woodswallow away. There were about three Little Corellas on top of a tree and a family of Pacific Black Ducks floated past on the stinky weedy river. I went back to Talbragar River Reserve this morning hoping to see a whole bunch of exciting new birds. I saw one I had not seen for a while, a Little Friarbird. 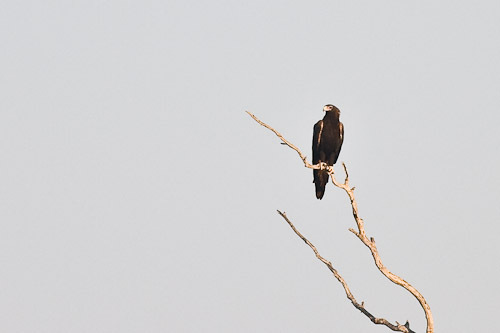 Plus I managed to spot a Wedge-tailed Eagle sitting on top of a dead tree way off in a paddock. It was a shame I could not get any closer, he was a very dark one. The Black-faced Cuckoo-shrike were flying around playing chasies like they were combat fighters. I have never seen such superb flying. I guess they were young ones at play. 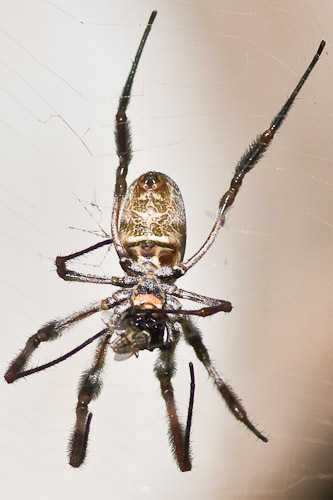 On the way back I spotted this massive spider chomping down on a fly. To do the 3 Bridges Riverbank Walk in Dubbo, park behind the information centre and walk across the river and follow the track on the other side and come back on the third bridge. Its quite a good walk with lots of River Red Gums and pine trees along the river and the track. There were lots of feral pigeons flying around the railway bridge. They seem to love bridges for some reason. Maybe because they nest under them. There were not a lot of water birds on the river, just a few Australian Wood Ducks and some Purple Swamphens. Around the second bridge I saw what I thought were some Noisy Miners, but on closer inspection they turned out to be Yellow-throated Miners. You do not usually find them on the coast, they like the drier inland country. Further along I came quite close to a mob of Red-rumped Parrots who were feeding on the grass by the river. I was about two meters away from them before they realized there was a very close human nearby. It was too dark at this stage to get a photo, so they missed out this time. All in all, its a good walk and probably best in the early morning. There was a wide variety of bird life, but watch out for the joggers and dog walkers! The Goonoo State Conservation Area is out along the Mendooran Road. Take the Newell Highway north towards Gilgandra and turn off at Brocklehurst. 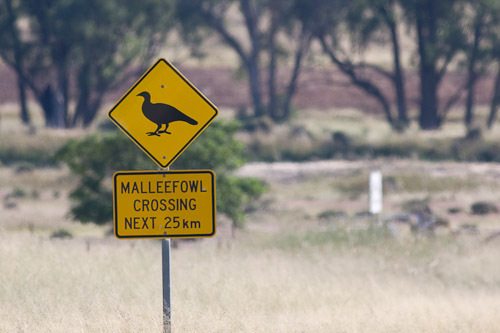 It is supposedly home to the Mallee Fowl, but this is the only sign of it that I saw. In the morning I woke up to a chorus of Magpie-larks and a curious young Grey Butcherbird. Then there was the noisy Galahs wheeling overhead. 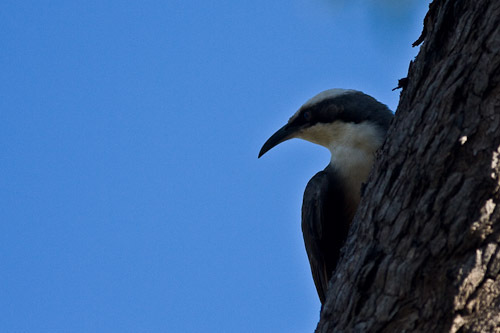 When I went for a walk in the scrub, all I spotted were some Noisy Friarbirds. The country is mainly dry with that pines and ironbark combination that is popular with outback dry habitats. I walked up the road a bit and followed a dry creek bed a few hundred meters. There were some Eastern Rosellas, Yellow-throated Miners, Common Bronzewing and a mob of white-winged Choughs. I had about a week in Newcastle then set off yesterday afternoon heading west. I made it to Cassilis Park Rest Area where I camped for the night. Its about 45 kilometres west of Merriwa. In the morning I carried on towards Dubbo and stopped off at the Talbragar River Reserve, which is a few kilometers along the Old Mendooran Road, off the Golden Highway. Beni State Conservation is at the corner of the highway if you want to go there as well. 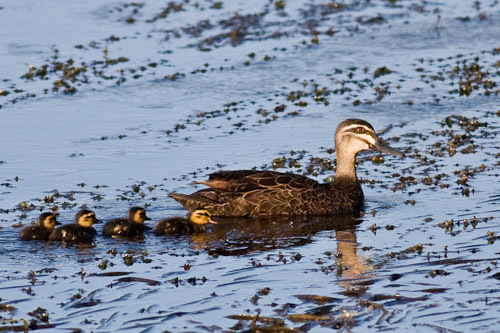 You can get a Bird Routes of the Dubbo District pamphlet from the Tourist Information Centre in Dubbo if you like or download it from the Dubbo Field Naturalists website . It was pretty late in the morning for me, nearly eleven o’clock, but I decided to get out the camera and have a look anyway. There were a few of your standard birds like Sulphur-crested Cockatoos, Galahs, Willy Wagtails and magpies, as well as a few Black-faced Cuckoo-shrikes. I was hearing this whingy call from the other side of the river, so I went over there. I was thinking it was either Apostlebirds or bowerbirds. 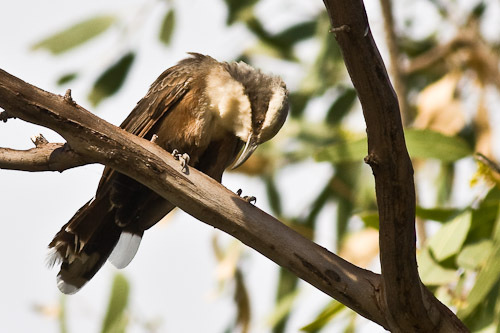 I did not think of the other bird that have this kind of call – the babblers. 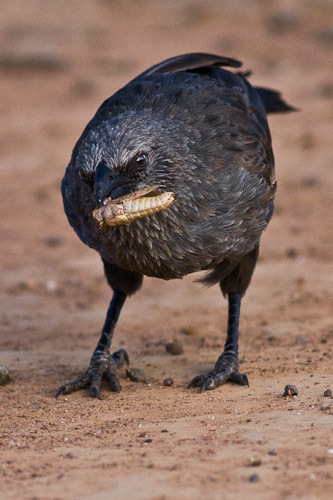 It ened up being Apostlebirds, although there were a couple of White-browed Babblers who were hanging out with the Apostlebirds, seemingly arguing and looking for the same kind of food on the ground. 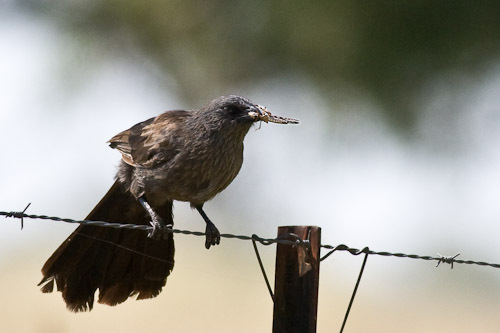 This Apostlebird had what looks like a grasshopper on the wire fence. I also saw a pair of Peaceful Doves who were calling quite plaintively. 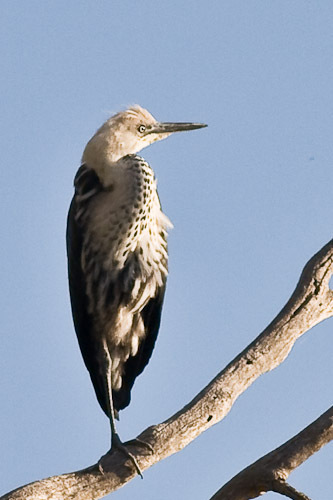 A Sacred Kingfisher was on a branch over the river waiting for a feed, and there were a few Striped Honeyeaters feeding on the gum trees. This one was trying to get at some kind of leaf curling insect or bug. And it was another old favourite for me this morning. Galgabba Point is at the corner of Marks Street and the old Pacific Highway in Swansea, Lake Macqurie. The bush regeneration team have done an amazing job. They just keep getting better and better. Well done Sharon and the crew! When I first got there I saw Little Wattlebirds, Black-faced Cuckoo-shrike and Noisy Miners at the entrance near the street. As I went further in to the bush, I spotted a few New Holland Honeyeaters and a female Satin Bowerbird. I also managed to get some good looks at an Eastern Whipbird who looked like he was feeding on the fruit of the lantana bushes. 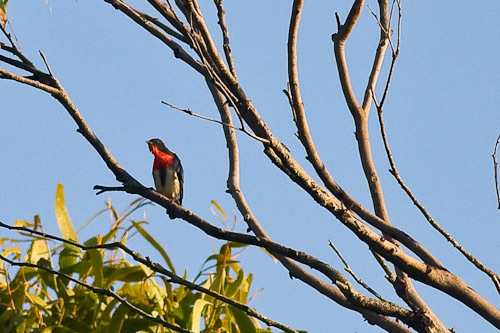 I was very happy to see a few Mistletoebirds, who were sitting up quite nicely and doing some great singing. 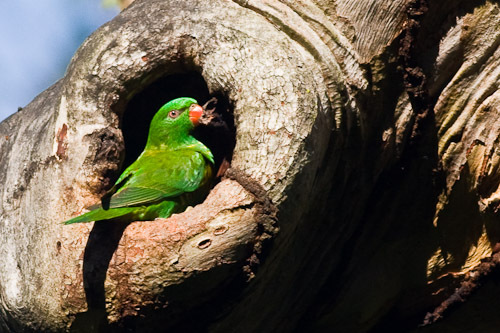 I also spotted some Little Lorikeets, so that is a good sign for the habitat. A pair of Scaly-breasted Lorikeets flew into this knot in a tree and went right inside for quite a while. I was thinking it was a nest, but I am not totally sure. 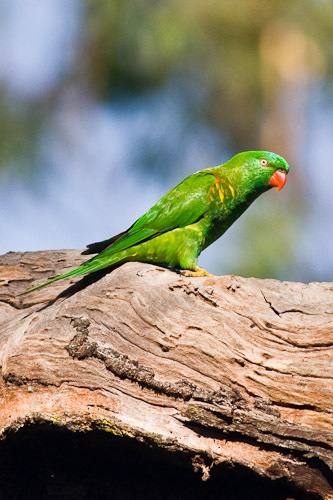 Interestingly the Scaly-breasted Lorikeet sometimes hybridises with the Rainbow Lorikeet. You can identify it by the all green head and the red bill. Well it was back to the sandspit for another time. I missed the tide going out and was too late. The tide was too far out and the birds were a long way out on the mud-flats. The best time is two hours after high tide. But anyway, I went ahead to have a look what was out there. Mostly there were some Bar-tailed Godwits as well as quite a few Black-tailed Godwits. 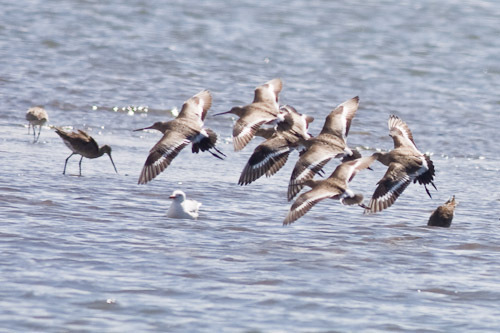 The only way I can tell the godwits apart is from the black tip on the end of the Black-tailed Godwit’s tail. Also the Bar-tailed Godwit bill is a little bit more turned up. There were also quite a few Red-necked Stints. 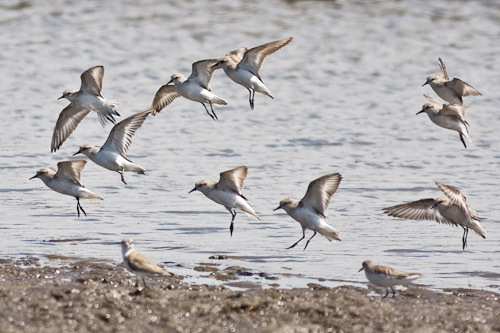 I was having a few problems identifying them at first but after having a good look at their bills and seeing the black stripe on the tail, I was pretty sure that they were Red-necked Stints. And also the size. I have just found out I have convict ancestors. How cool is that? And they are Irish transported for stealing a watch. Here is the transcript. Thanks to my brother Lawrie for some excellent research. Tried Dublin 8/4/1833 for stealing a watch; convicted and sentenced to 7 years transportation to Australia. Description ; Height 5'4.5", complection : fair, ruddy,freckled,small mole left cheek,Hair light brown , Eyes,grey. Report from principal Superintendant of Convicts, Date ?? And this is my grandmother, Clara Larkin, descendant of the convict James Larkin.